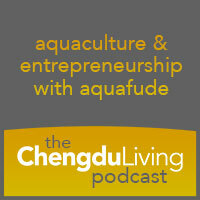 Aquafude are trying to change the way fish are raised and consumed in China. They’ve been going all over Western China changing the local fish farming practices, which includes measuring pollution levels, changing the feed provided to the fish, and much more. The result is a domestic product that they argue is fresher, healthier, and more delicious than anything else you can find in China. I talked with Ari Jadwin and Matt Tatkow from Aquafude about importing Chilean fish feed, what the 2008 earthquake has to do with the fish farming, and what it takes to convince local fisheries to embrace a sustainable mindset. 1:00 What is an aquaculture company and what does Aquafude do? 4:30 What kind of fish are salmon trout and why are the good for mountain communities? 6:00 Why aren’t farmers in Western China raising traditional livestock? 8:15 How did Ari and Aquafude get involved with fish farmers? 13:50 What were the barriers to selling this proposition to fish farmers? 23:10 Are the farmers converted to appreciate sustainability now? 38:40 How does Aquafude find new fisheries? This was pretty educational for me, not knowing anything about this industry at all. I can see the challenge of doing something like this in China where there will naturally be a push against spending more to get things like sustainability and longevity out of a resource that is facing a scarcity problem. Aquafude is fighting the good fight though, I wish them luck. Thanks for recording and posting this, Dan. Great podcast. One of the best so far. Thanks Ian! It was a surprisingly fascinating topic for me, no doubt. I’ve always joked about eating fish in landlocked Sichuan – I had no idea that the fish farming community was as vital as it is or that there was so much potential. Seems like Aquafude has found a really promising niche food market and are approaching each challenge in a responsible way. I was also surprised to learn that, as put-together and professional as Ari is, he’s only 27 years old! Interesting and impressive business venture. I’d be curious to know more about how they are navigating the usual hazards to foreigners doing business in China, especially the one relating to the fact you have to have a Chinese partner who owns 51% of the business. They are probably navigating the hazards the same as other expat entrepreneurs in China: with great caution. But I am certain that it is not true that foreigners doing business in China need a partner who owns 51% of the company. Wonderful action for communities, fish, and people. But question, Ari Jadwin and Matt Tatkow: what is the nutrition comparison to ocean fish or free-swimming fresh water fish? Most know the nutrition quality of farmed fish is much much less than those of free-swimming fish, due to multiple factors of the artificial environment. Any scienctific studies on the quality of nutrients the human body receives? Thank you!